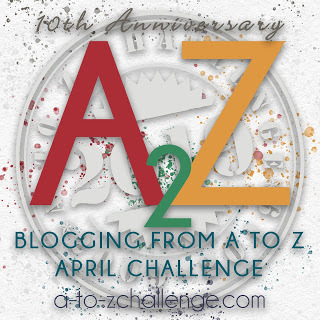 I am proud to be able to say that I completed the 2013 A-Z April Challenge. This is the 2nd time I participated. Writing everyday is certainly a challenge. But, taking on the challenge has taught me that the less often I write, the harder it is to get back on the writing wagon. And the more I write, the more I want to write. The first year, being a newbie and all, the challenge was a personal one. My main focus was getting to the finish line. Although I did make an attempt to visit other blogs that first year, it was not a priority. This year, being a seasoned veteran and all, I knew I would be able to complete the A-Z part. So, I made more of a commitment to not only visit others, but actually let my presence be known by leaving comments. At first, when I would visit another blog, one of the things I found myself doing, was making a snap decision about the post I was reading based on a clever title, the first few enticing sentences, or whether the blogger and I were like minded. I quickly learned, though, this was not a good decision. Because once I changed my approach to not look at the “About Me” page first and read a post in its entirety, I discovered that each of the participants were part of a wonderfully diverse, funny, interesting and caring, blogging community. This was, by far, the more rewarding part of this challenge. Although I didn’t nearly make it all the way through the 2013 sign up list, as a continued challenge for myself, I intend to continue to visit new blogs each day until I do. I want to thank the hosts, co-hosts, and ambassadors who put the challenge together, made it easy to participate and above all nudged and encouraged along the way. It was a lot of fun, wasnt it! Thank you for visiting my blog and for leaving comments. I am happy to have found your blog. I will visit often. Agree that the visiting is the best part. I've been real surprised this am to read how many people didn't make an effort to do much visiting if any in their reflections post. Most seemed to focus on the writing, and if they visited they only visited their specific genre. Congrats on finishing and glad you enjoyed it. By the way love your banner, picture at the beach...it's funky the way you've altered it. Thanks Sandy! I am working my way thru the reflections posts now. I didn't get through the whole list either and found numerous blogs that I just didn't have anything to comment on. I also enjoyed getting out of my usual blog rut, however, and exploring blogs that I normally wouldn't have found. Glad to have found you! Sorry to say I made those snap decisions too - but one had to be brutal to make it through the entire list of participants. Cheers from one AtoZer to another! That’s true, there were an awful lot of blogs to get through. I guess it was necessary to be a little discriminating. I knew there was no way that I'd make it through that entire list of blogs. I kept up with the five-a-day only. I think that's way more manageable. I too learned not to judge a blog by it's cover. Good reflections.